If Edvard Munch’s “The Scream” isn’t enough to create the anxiety within you that it was intended to invoke, then its $119,922,500 price tag should do it. The iconic work Munch produced in 1895 is supposed to be a reflection of an anxious society on the verge of a new century. I guess that’s why it continues to entrance people. 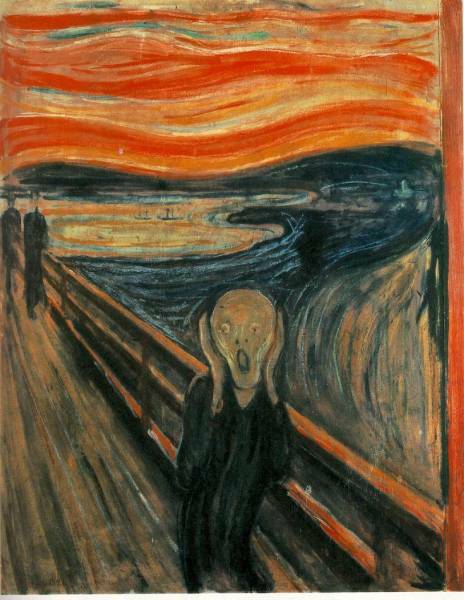 Last week “The Scream” broke a world record, becoming the most expensive artwork sold at an auction conducted by Sotheby’s. The figure in the drawing – which is actually a pastel on board and not classified as a painting – is said to be man holding his head and hollering beneath a blood-red sky. I’ve always thought it looks like an androgynous cretin drawn by an angry kindergartener. But, if people in 1890’s Europe were angst-ridden, then I’d hate to see their reaction in early 21st century America. And, of course, being the good artist he was, Munch let his dreams move his hand. Who says artists aren’t human?